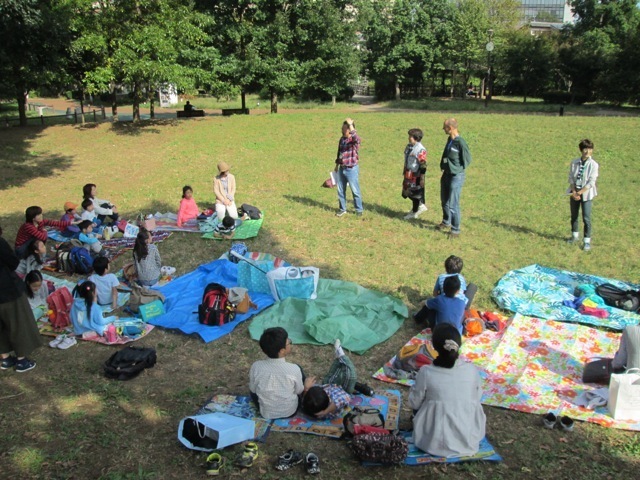 I want to thank all the children and parents who came to Ecole Hibari's Family Picnic Day on October 23. This was the first time we had ever held a picnic and it was fantastic. We started at 10 o'clock in the morning. 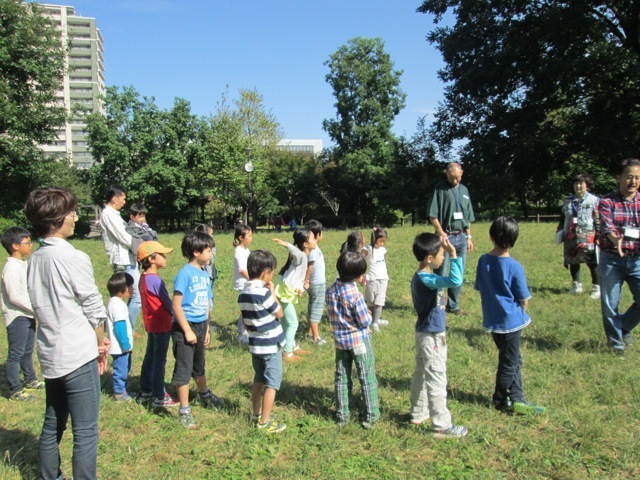 At first, all the students, teachers, and staff introduced themselves in English. The first game played was called The Farmer's Game. Two teams were created. The idea of this game was for the children to run and put on a shirt, a long scarf, and a cap as quickly as possible. The child then ran around a cone and proceeded to take off each garment and ran to the next student. The next student then continued this process until all students on each team had done the same thing. This game was so much fun to witness. I wish you were there to see this. The next game was called Freeze. Students played as a group. Music was used for this game. As a song was played on the CD player, Henk and I shouted out commands (run, jump, kick, and so on) for the students to perform. When one of the teachers yelled, "Freeze," the children had to stop and not move while still in the action that was last performed. The song then started and another teacher called out different commands and then yelled, "Freeze" again. The part I loved best was when the kids had to continue "smiling" for three or four seconds without moving. I was rolling with laughter and so were the parents. These were only some of the events that we enjoyed throughout the day. Oh yes! I almost forgot. the children brought their own lunches. We ate together and shared enjoyable stories with one another while eating on a beautiful, sunny day. This was a great day! I hope we can all do this again. Thank you for reading. Until next time. Bye.